Last week was one of my favorite times of the year. It was the week of our county fair, Besides loving helping my son prepare his dairy show cows for the 4H and open shows, I love visiting with community members. My favorite visits, though, are with former students. It is like a big reunion. All of my former students are special, but I have one former student that always schedules some time to sit and have a very quality visit. I end up blogging about our visit every year. I value this time because I learn so much. He always wants to know about what is going on in my life. This year, like every year, he had advice, words of wisdom, and encouragement that I will use in my professional life. Click here to read last year’s post entitled I Have Paid For An Education With My Mistakes about Andy Clark. Andy easily makes it to the top of my list of most respected students. He has truly become an outstanding agricultural leader. Innovating – Innovation is a very important leadership trait. Andy has created different paths for producing for markets with specific needs. These specific needs offer a better chance at evening out the peaks and valleys of commodity marketing. Amazingly, once he has innovated in one area, he is already looking for the next. Resourcefulness/Adaptation – Andy clearly has a handle on looking for ways to improve efficiency, make use of byproducts, and reformulating to keep the farming operation on a progressive track. Managing Time and Leading People – I was so impressed when Andy was describing his plans he had recently put in place to retain and develop his employees. His wage/compensation plan has made it possible for him to retain and attract employees and have them where they need to be, at the time they are needed. 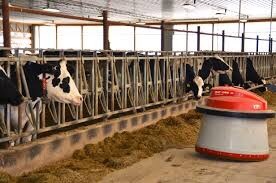 A large part of his operation is in forage making for dairies. Anyone who has ever made hay or chopped silage knows you must harvest when the crop is right. Andy has developed his leadership skills for maximum employee efficiency. He understands that the achievements of our workforce are crucial to the successful delivery of strategy. Financial Management – Every dollar saved in expenses is a dollar that directly benefits the bottom line. While expense control is time consuming and tedious, great farmers spend the time to reap the benefit. Living expenses, equipment and machinery purchases, decisions related to using contracted services (like custom chopping of silage), spending habits, areas where can you cut back, and investments that aren’t the best ideas today. These can be the differences between breaking even, losing money or just eking out a profit. Andy knows to the exact penny what it costs to produce a bushel of grain or ton of forage. Attention To Detail – During our visit, Andy pulled out his cell phone and began to give me a tutorial lesson on JDLink™. This allows Andy to see critical and timely information about his machines, online, and better yet, on his cell phone. By using the MyMaintenance™ app, he is able to move data to and from his machines – easily, securely, and wirelessly. This enables Andy to support his machines and employees, thus keeping the operation running smoothly and efficiently. We talk a lot about SMART Manufacturing and Industry 4.0, but this is truly Agriculture 4.0. Andy is on the pioneering side of using it. Growing Professionally – I don’t think I know anyone who is constantly learning to the extent that Andy Clark does. He was like that in high school – always studying something and thinking about the next thing he might want to do. He’s like the farmer version of Curious George®. Andy stays connected to knowledgeable sources of the latest information and innovations. He is very interested right now in robotics and wants to be a pioneer in the use of robotic equipment. The bottom line is that Andy is motivated to learn – a characteristic of a great leader. As you can see, Andy Clark has developed into quite farmer and leader. Every year when I visit with him I become prouder of him and more impressed with him. We are planning to get together before another year passes and I hope we do because I learn and grow every time I have the opportunity and sit and visit with Andy. Do you have leadership traits that you need to develop and hone? During my personal growth time this morning I was reading more in the great book, Leading Like Madiba: Leadership Lessons From Nelson Mandela by Martin Kalungu Banda. In the passages I was reading this morning Kalungu-Banda used the metaphor of leaders being like yeast saying, “Inspirational leaders are like yeast that permeates ordinary flour and water, making them rise into a good dough. This is a lot of what leadership is about: imperceptibly raising others to realise their own greatness and the esteem they deserve. A lot of the effect is gained simply by listening to people with respect.” Is that not awesome and so true! This got me to thinking about the yeast we feed in our dairy herd. Yeast is a simple single-cell fungus. That is why I love Kalungu-Banda’s metaphor. As leaders, we are all pretty simple human beings but by creating the right environment we can do great things. The yeast that we usually mean in the context of food and livestock feed is the species named Saccharomyces cerevisiae. Saccharomyces cerevisiae has been used by man for millennia to produce alcoholic beverages, including beer and most spirits, and to enable bread to rise during the baking process. During the early 1980’s when I went to Purdue University and was getting my Animal Science Degree, we were just beginning to research the use of yeast in ruminant (cattle are a ruminant – meaning four compartment stomach) feeds. The research being done was on the effect of yeast culture on ruminant production and rumen microbial metabolism. Effects on production were always small, which led to many questioning their statistical validity. The reported effects on rumen metabolism often seemed unrelated: Stabling pH, improved fibre digestion, lower lactate concentrations, altered fermentation product proportions in favour of propionic acid, lower methane emission, increased concentrations of cellulolytic bacteria, increased concentrations of cellulolytic bacteria, lower soluble sugar concentrations, decreased ammonia concentrations, all by the supplementation of a few grams of yeast to a cow with a rumen volume of 100-150 liters. Thus, if yeast could maintain a more stable, neutral pH, ruminal micro-organisms would be healthier: healthier ruminal micro-organisms lead to a more productive animal. Remember, this is all with only a few grams of yeast. Therefore, I would add to Kalungu-Banda’s use of yeast as a metaphor and say that by just doing the right small things can create an environment where people can grow and flourish. When studying the effectiveness of yeast culture we needed to understand yeast’s mode of action at the molecular and cellular level. Sound like leadership? Leaders develop their team members. They serve as the yeast by helping the team members gain new skills to help the team increase its ability to reach the organization’s goals. One important skill the leader teaches the team is leadership. Just like yeast, we need to be doing the little things that might seem like much, but will have big effects on those we serve and our organization. Are you leading yeast? Many times leaders wonder what they can do to become well-rounded and competitive while increasing both their success and significance. An often overlooked yet simple way to improve is to increase our knowledge by being a lifelong learner. Structured education and professional growth opportunities are very important, but much success is derived from highly motivated individuals that have dedicated their lives to the concept of lifelong learning. Many times this learning is unstructured and just involves us paying attention and recognizing opportunities to learn. We all need look for these opportunities and prioritize the creation of time in our busy lives each day to educate ourselves on new concepts and ideas. Last week I had an opportunity to learn just by observing the technique of someone else. We had two of our show heifers dehorned and we always get pain medicine (comparable to Tylenol® or Ibuprofen) in the form of boluses (big pills) to give for seven days. These are given orally with a bolus gun (pictured here). Growing up as a farm kid I have done this hundreds of times. It always seems, however, I end up fighting with the animal before I get the pill given. This time, though, I watched as the veterinary technician gave the first round while still at the vet’s office. She had an interesting technique and I took note of the way she held the calf’s mouth open. The calf did not fight and the pill went right down. The next day I used her technique and voila′ it worked perfectly. Let me tell you, I gave the seventh and last bolus tonight and all went perfectly with no fights every night. I am very excited to have learned a new technique. This experience reminded me just how important it is to take advantage of every opportunity to learn. I try to learn something in everything I do. In fact there is a direct correlation between individuals who strive for growth in their personal lives and those who thrive in their professional lives. I really believe that the learning I do in my farm life does help me grow as a leader in my professional life. In an ever-changing world, it is more important than ever to stay current, competitive, and up to date – both in our personal and professional lives. We must rid ourselves of assumptions and convictions so that we can be open and receptive to new information and learning. The uncomfortable part is that at times the things we are observing or learning may contradict what we believe to be true. If we truly open our minds to lifelong learning we will come across information that challenges your worldview. We need to strive to jump out of our comfort zone, use this time to stop, reflect and shed light on these ideas in a way that can develop and expand our knowledge and vision. Just like my learning a new way to give calf boluses by watching someone who does it many times per day. Now, I realize that my story from the vet’s office is a simple one, but the concept is important. We need to always be on the lookout for ways to improve and learn. Again, these do not need to be structured, and I would argue many times the best learning comes from paying attention and observing. Think about it, I could have just said, “That’s not the way I do that.” All that would have got me is the same old inefficient way of giving boluses and continuing to wrestle with calves every time I do it. Amazing what an open mind can bring us. Hopefully this reflection will give us all a renewed commitment to learn new ways to expand and to sharpen our personal and professional skills. Reading great books, consuming excellent electronic media, and participating in engaging continuing education programs, from varied sources, will keep us informed, in touch with, and energized by new ideas – but only if we commit to our own learning. And, pay attention to lessons happening around us. Will you commit with me to being a dedicated lifelong learner? Dr. Kaufmann was a teacher and counselor of gifted children, grades K-12, a professor at Auburn University and the Universities of New Orleans and Kentucky and served on the Boards of the National Association for Gifted Children and The Association for the Gifted. I believe that while her work was with gifted children, the principles apply to all. Furthermore, I believe all children are gifted in some way. This is why it is just as important for us to make education relevant and form relationships with our scholars as it is to make education rigorous. Success looks different for all of us and it is not something we can graph with a straight line. 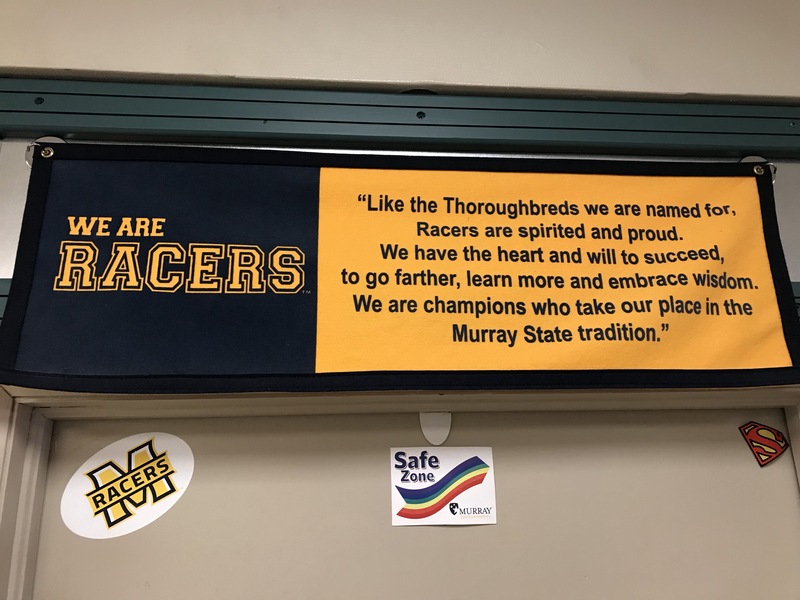 As we were visiting Murray State University this past weekend I really began thinking about this. It is our job, as Heath’s parents, and his school’s job to help him identify and understand his real needs and support him in finding ways to meet those needs in a constructive and personally meaningful way. Not an easy task. In thinking about this I was reminded of thoughts from Howard Gardner at a recent Project Zero gathering at Harvard Iniversity: we need to move away from thinking “How smart are you?” To “How are you smart?” To me this means we need to take into account how our students learn and what he or she really wants to be learning about and doing. Having raised and raced thoroughbreds for a time in the past I can so relate to this. Every racer had a mind of it’s own and every one had different talents – distance, sprinter, likes mud, likes to be challenged, wants to come from behind, needs to take the lead, high spirited, easily distracted (needs blinders), et cetera. Sound familiar? Heath still likes playing in the mud! 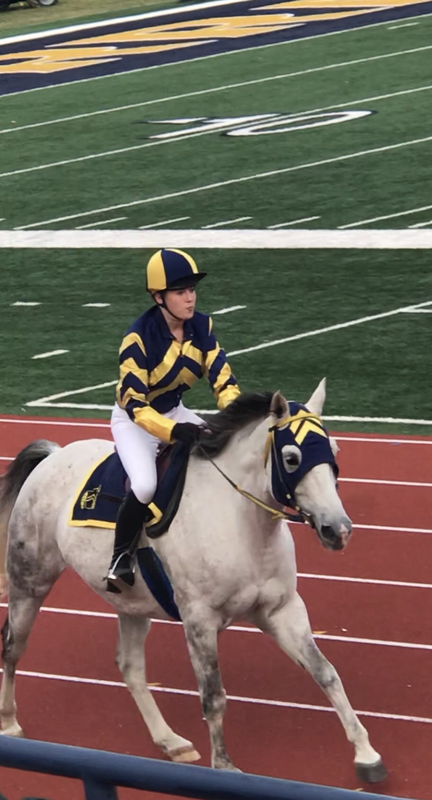 Our challenge as educators and parents is to, like the role of a jockey, rein and channel a constant flow of ideas. The art is to know how much rein to give and when to give it. 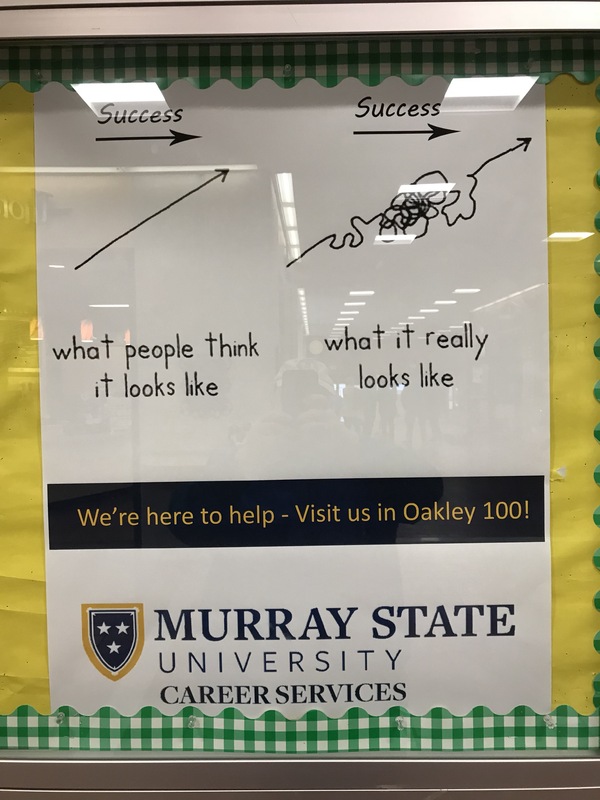 I was so impressed with Murray State’s student centered focus. 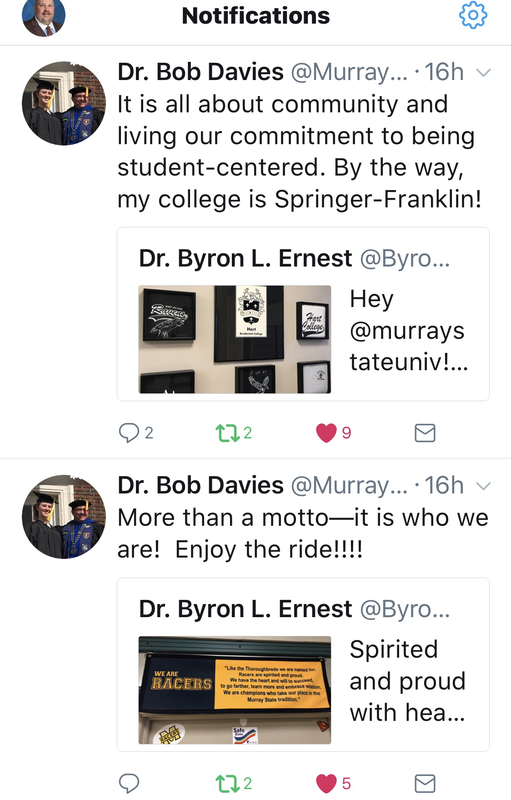 And, you guessed it, even ended up tweeting about it with Murray State University President, Dr. Bob Davies. 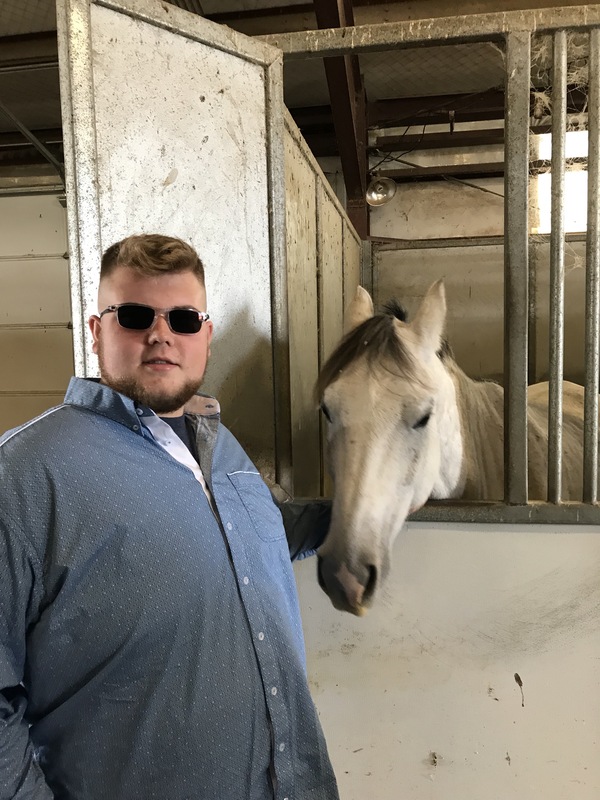 We had a great Agriculture School Ambassador, MacKenzie Jones, from the Hutson School Of Agriculture who spent time with Heath and have him a personal tour of the university and university farms. He was so impressed with how personal the education was tailored and the close relationships between professors and students. 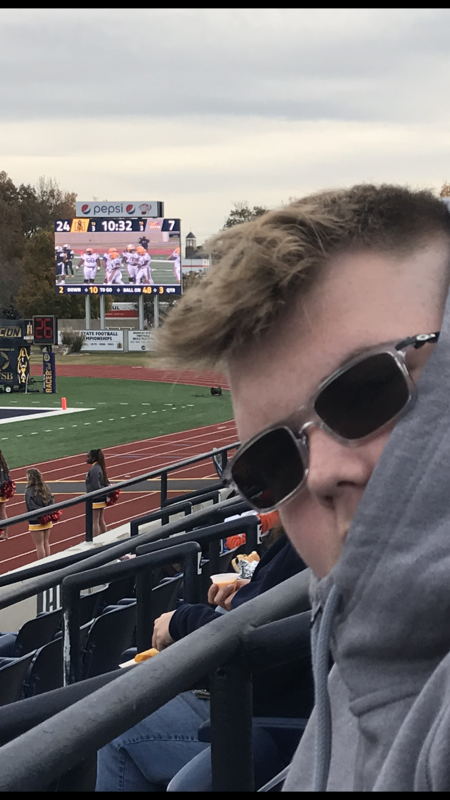 MacKenzie drove home the fact that it is not just about getting a degree; it is about getting a true education through hands-on experiences and the faculty understanding the students’ needs and what makes him smart. She explained that a tudents in the Hutson School of Agriculture receive a “large university” education in a small school setting. 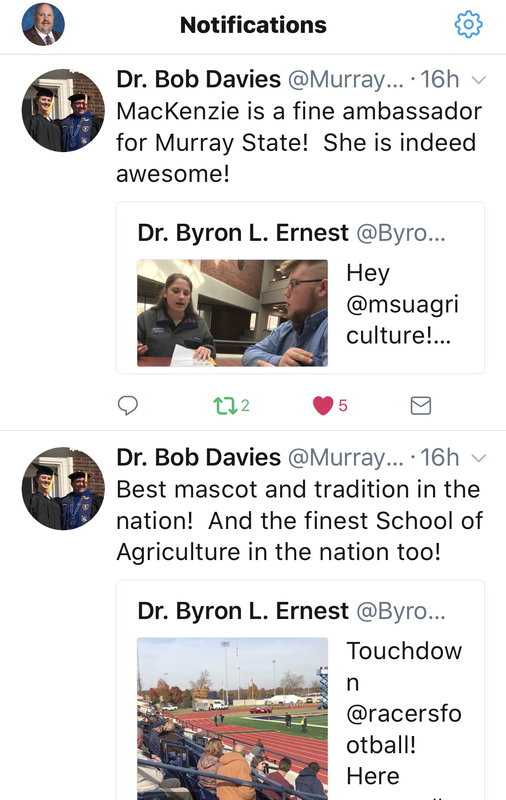 It was great to visit a university that is truly student focused, giving students the personal attention they need, but also providing them with current and breaking agricultural technology to take their education to a level that will make them highly competitive in the job market. This past week was one of my favorite weeks of the year. 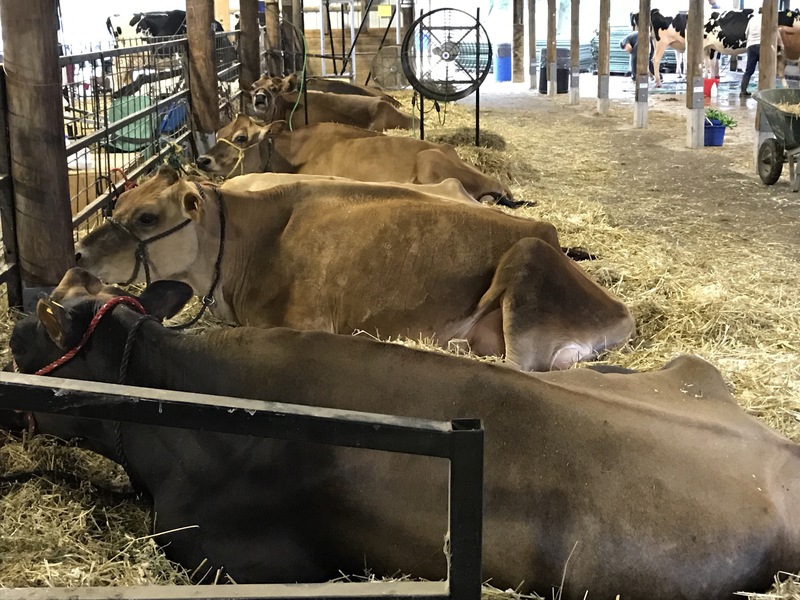 I spent the week at the Boone County Fair (Lebanon, Indiana) showing Jersey dairy cows with my son. This is incredible dad and lad time. The county fair is the time of year when I get to see friends and visit with former students. It is great to catch up. One visit I look forward to every year is with Andy Clark, a Lebanon graduate I had in many classes and one of my favorites and great ones. This year, like clock work, Andy showed up with his wife and kids and we sat at our dairy stalls and talked for a couple of hours. I blogged about last year’s visit in “Matching School Work To Real Work.” Click here to read that post. During our conversation this year I was struck by his comment of “I Have Paid For An Education With My Mistakes.” This is the true mindset of a lifelong learner and someone who has a growth mindset. Andy supplies chopped hay and straw to Fair Oaks Dairy in northern Indiana as part of his farming operation. We talked a lot about how he learns, researches, experiments, and iterates to make his operation successful, efficient, and profitable. I could not be prouder of what Andy has accomplished and the great leader he has become. Andy really gets what it means to be continually learning and to work toward continual improvement. He is an example of what we must be making sure we prepare our students to be ready for. As we work in Indiana to create worthwhile graduation pathways we must make sure we are providing the correct avenues for students, like Andy, who are going straight into he workforce with careers. Research shows that students are nervous about making any mistakes — but with a little encouragement by teachers, they begin to take risks, and growth by leaps and bounds. On the other hand, other students who were so anxious about making mistakes they would not take any risks at all, and the research showed their anxiety slowed the process of their learning. Mistakes play a powerful role in learning, as well as the huge influence that the teacher’s attitude and feedback play on a child’s perspective on mistakes. We need to help students become comfortable with mistakes and help them learn how to grow from them. This is difficult to do for some because despite the fact that making mistakes seems to be a part of who we are, mistakes are still not readily accepted. We act like they didn’t happen. We blame someone else. We feel embarrassed. But this isn’t how mistakes should be viewed — especially in schools. I would assert that Andy should be an example for adults, too. I would argue whether you are a grown adult or are a school age child and you don’t make any mistakes, then you aren’t really learning anything new. School, especially, is the one place that’s all about learning. It’s the one place where mistakes should be not only accepted, but expected. Why should mistakes be an expected part of learning? If students, who then become our workforce, entrepreneurs, and future leaders, don’t learn early on how to handle them on their own, if they are regularly rescued by well-meaning teachers and parents, then they won’t develop the skills needed to tackle difficult things or bounce back from setbacks. Skills like perseverance and gumption. Despite the rhetoric around mistakes being necessary for learning, I believe it is rare that you truly see mistakes embraced and celebrated as learning opportunities. We must learn from individuals like Andy that learning from mistakes is an important part of being successful. In most schools, “success” is defined as getting high marks on tests, with results (and minimal or no mistakes) mattering more than the process of learning or the process of getting to the answer. And when the results aren’t good? Students feel embarrassed or shamed. We need to change this. We must create environments in our schools, businesses, and organizations where everyone see mistakes not as impenetrable roadblocks, but rather as a natural part of the learning process. Have you received an education from your mistakes? My family and I are on vacation this week in the Black Hills of South Dakota. As you can imagine I have been reading up on the Lolitas, Sitting Bull, Crazy Horse, General Custer, the US involvement with Native Americans, and of course, Mount Rushmore. Despite all this learning, there was another lesson staring us in the face as we travelled completely across (literally) the awesome state of South Dakota: almost every mile of Interstate 90 of side ditch (what we call the roadsides in Indiana) were either baled, being baled, or being mowed for hay. We were amazed by the quantity of grass hay being baled on these roadsides. 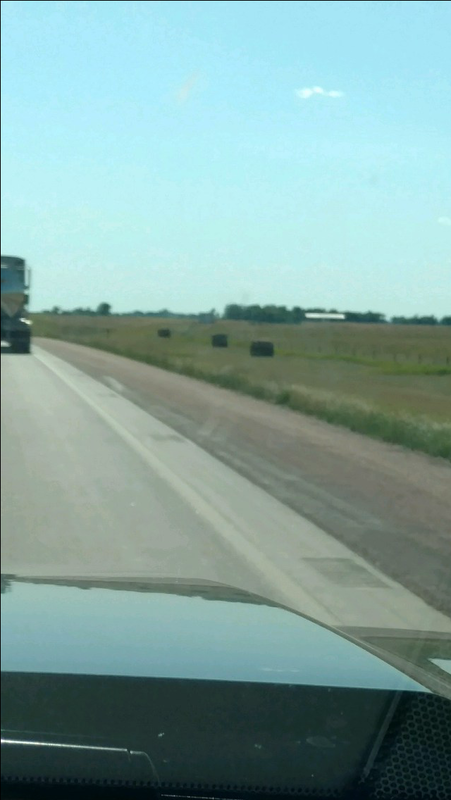 For one stretch, my son Heath, counted 150 big 6’X6′ round bales on the north side (west bound) lanes of the interstate and got tired of counting. Heath really got me thinking when he said, “Dad, this is genius, why don’t we do this?” He went on to say, “Look at all the good hay they are getting and the state does not have to pay to mow roadsides.” I was pretty proud of his thinking – particularly cutting government costs! Then I got to thinking that we need to find the roadsides to mow in all our organizations. What might be going to waste somewhere that our own business, organization, or school could be using? I am sure if we spent a little time brainstorming we could come up with some pretty amazing stuff. In my own case of leading a school, I talk a lot about existing infrastructure. In other words, what are others doing that the school could partner with and not have to use State dollars to provide? I think about this a lot around social services. To me it does not make sense for schools to spend a lot of money on services that are being provided in every county; and done very well, I might add. I continue to say we need to develop a “constellation of services” so we are not all trying to do the same thing. Really, we need to be thinking like a farm kid. As a young boy I would go to the local elevators and other farms and clean up their grain screenings (broken corn kernels and chaff that is screened as corn goes up the elevator). Left in piles it would just get wet and gross as it rained in the fall. These screenings were dusty to pick up and no one really liked the job. For me, it was an opportunity. I could spend the fall feeding out some pigs on all the grain screenings I collected. In fact, it got to where people would call and tell me the pile was getting big. Also, I was always very busy collecting the screenings when the weather report was calling for rain. 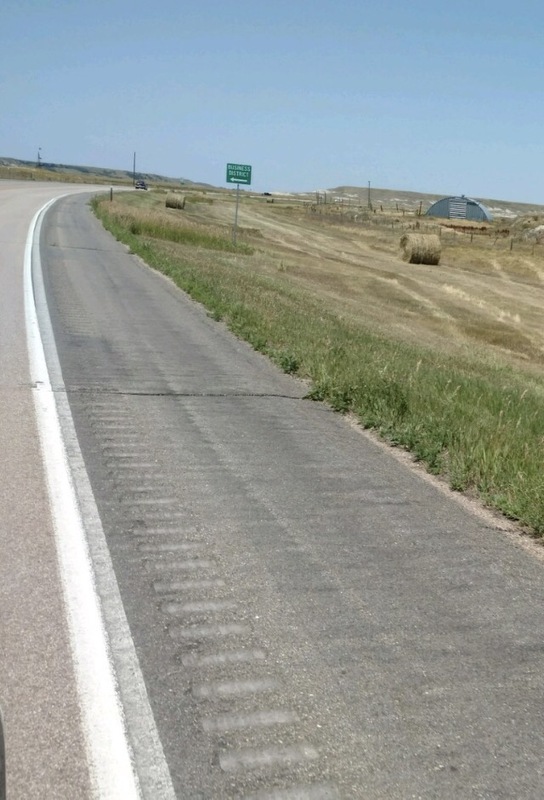 So, just as the farmers in South Dakota, and I’m sure other states, apply for permits to bale roadsides, we need to consider what our opportunities for baking side ditches are. I’m sure they are out there if we just take the time to look. I really believe that the kind of man a young boy becomes, is dependent on what his father taught him during moments spent together. Keep in mind here, my post is only about the father/son relationship and time spent together. Time spent bonding with our children teaches him positive principles, instills honest values and virtues, and presents countless life lessons, or learned knowledge, along the way. To do this, we must simply help our sons cultivate their own interests and encourage their wandering spirit. My son, Heath, and I had just such an outing yesterday. 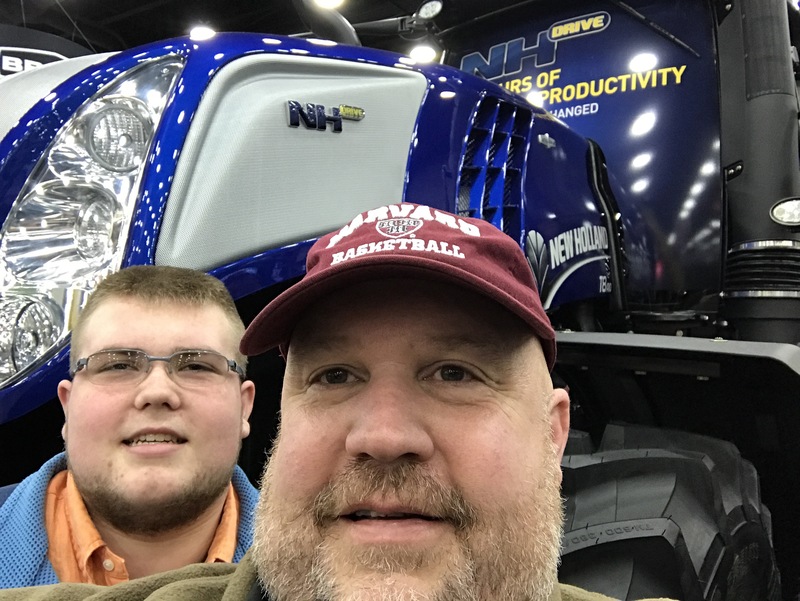 We attended the National Farm Machinery Show in Louisville, Kentucky. It’s the largest of its kind. 850 exhibitors covered 1.2 million square feet of floor space in the Kentucky Exposition Center as the National Farm Machinery show continues to be the largest indoor farm show in America. For 52 years, the National Farm Machinery Show has offered the most complete selection of cutting-edge agricultural products, equipment and services available in the farming industry. I have been to the show for most of those 52 years of shows because my dad went to them all and always took me. Business professionals from around the world gain knowledge and hands-on access to various technological advancements needed for the upcoming farming season during the four-day show. We spent time looking at the newest precision equipment and discussed how that was responsible and important for being good stewards of our planet. We were amazed at the milking robots and barn cleaning robots. Heath wants one, by the way, but it ain’t happening because we are still teaching work ethic on our farm, too. We literally went through all 850 exhibits and it seems, had a conversation about each. I love the international aspect of the show. It gives Heath and I the opportunity to interact with agriculturalists from around the world. 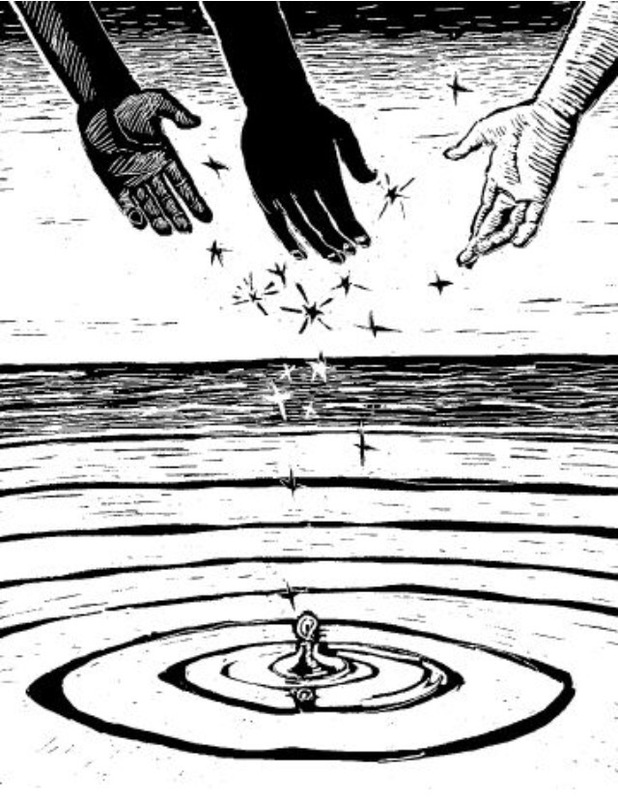 The ripples of this coming together will bring about positive social change in agriculture. Above all, this father-son activity works well as a platform for instilling values and teaching lessons with my son. Sometimes, the message is subtle, but that’s often how a lasting impression is made. What lasting impressions are you making?